The Great Mathnasium Gratitude List! As we get ready to take some time off work and gather with friends and family this Thanksgiving, we’d like to take a minute to share a small sampling what we’re thankful for here at Mathnasium HQ! The privilege of living in North America. At peace. The privilege of making a difference. At work. The privilege of a mission that inspires. At last. The privilege of working with children. At length. The privilege of working with great people. At all times. Wishing you a Thanksgiving holiday free from any worry. At all! I am thankful for the continued opportunity to work with an exceptional team of people to change the lives of children everyday. I am thankful for being an American and the great individuals who sacrifice every day to keep our country free. I am thankful for my family ,especially my husband and son–and that we are all happy and healthy. I’m grateful to have married a woman who, after 24 years of marriage, still makes me feel butterflies whenever I hear her car pull into our driveway. I’m also deeply grateful for the people in my life who inspire me to be a better person. I’m grateful for sincere humility and humanity. The world is not as big as it used to be—we are all connected, much like a large extended family! Also, I’m truly thankful for Wi-Fi! The fact that I live in relative safety; that my neighborhood has been neither a war zone nor the site of a terror attack. Waze, podcasts and books on tape for making my commute as short and enjoyable as possible. Weather that is leaning slightly towards fall. I love clear cool days. Deep friendships with people who know me well and love me still. It’s quite a gift. My teenage daughter who calls me her best friend and lets me look at her Instagram. Bún Thịt Nướng, Japanese chicken cutlet curry, and good ol’ American fries… just because they’re tasty. The fact that, as a culture, we set aside a day to just be grateful, to give thanks for all have and all we are to one another. It’s a very good thing. I’m thankful for my outstanding coworkers who make working at Mathnasium fun and enjoyable—even when things get tough. I am thankful for being surrounded by people who accept me as the nerdy dancing mathematician that I am. I am grateful for my parents’ safety—they live overseas. I’m also grateful for my wonderful colleagues—especially my team! Go Accounting! This Thanksgiving, I’m immensely grateful for a career where having fun and being creative are essentially imperatives. I’m grateful for the luxuries of free expression and free will, a yoga practice that keeps me balanced and sane, my very colorful and exciting life path … and most of all, the blessings and support I receive from my friends and colleagues. Oh, and cat videos on YouTube! Thank you for being a part of the Mathnasium family—we’re so grateful for the privilege of working with you all! Wishing you a wonderful Thanksgiving full of infinite love, laughter, and gratitude! 2 users comments for " The Great Mathnasium Gratitude List! " I am thnakful that Mathnasium allowed my husband and I to become franchisee. We love our center and are blessed with an amazing staff and students. Thank you for letting us be part of the Mathnasium Family. 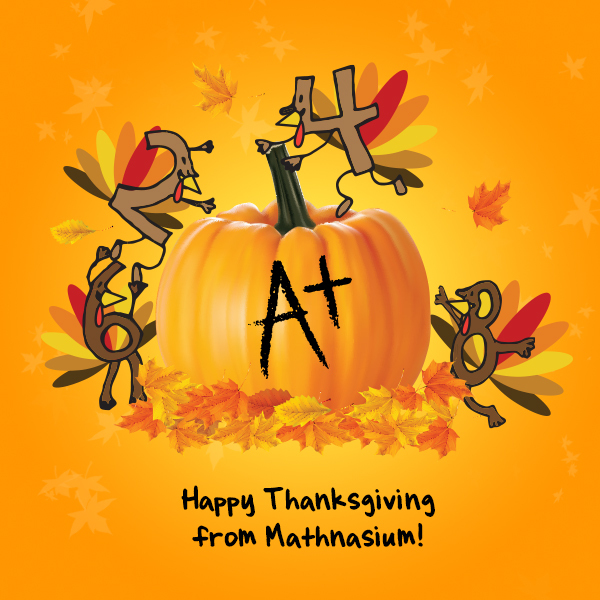 I’m thankful for all the work the Mathnasium founders and team have put in over the years. I’m thankful to all the “old-timers” who have tested and perfected a model. I’m thankful for all the parents and grandparents who give me the honor of working with their students. And, I’m thankful for all the students who want to be at Mathnasium of Warrenton more days than not, who are motivated to learn, and who can’t wait to “tell the instructors” about their great progress in math! Happy Thanksgiving all.